While polished pumps and strappy stilettos always make us happy, we’re putting some extra spring in our step this season with colorful ballerinas. Designers are kicking up their skimmers in a big way, elevating them in sumptuous dyed leather, fun florals and ornate embellishments. Chic and timeless (not to mention insanely-comfy) for the office or running around on weekends, channel your inner Audrey with our favorite styles of the season (plus, what to pair them with). BEST FLORAL: J.CREW Kick up your heels for J.Crew’s latest collaboration with UK textile company, Liberty of London, whose feminine florals adorn these Cece flats ($198 at J.Crew; enjoy free shipping on all orders with code FREESHIP). Not only are they incredibly cute, they’re made with padding, a rubber sole and a slight interior wedge for extra comfort. Pair them with accessories that pick up a hue in the print, such as this bubble gum pink stunner by Kate Spade New York ($198 at Kate Spade New York; you can also download their latest music playlist). 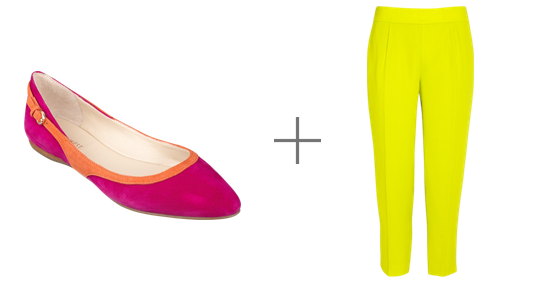 Add a pop of color with Nine West’s Superfly skimmers (on sale for $49 at Nine West; get $20 off!) crafted of fuchsia and tangerine suede. We’ll be wearing ours this spring with jeans and a tee on weekends, and with chartreuse capris (like J.Crew’s, $168 at Net-A-Porter) on days we’re feeling a bit more daring. Even his flats are red-carpet ready! Oscar de la Renta’s Petalina ballerinas ($825 at Bergdorf Goodman; free upgraded shipping with code SHIPBG) are spun of creamy leather and dressed up with dramatic beads and black florets, making them perfect with an LBD (such as this swingy little number by Topshop, $75) for dinner at a fancy restaurant or cocktail party. Add a dash of sunshine to spring showers with Tory Burch’s cheerful bow ballets ($125 at Tory Burch; enjoy free shipping) crafted of water-resistant rubber and finished with a feminine bow. They’re a chic alternative to rain boots, and the perfect complement to Missoni’s cute chevron umbrella ($69 at Saks Fifth Avenue; score free shipping with code SFAFEB). Marc by Marc Jacobs kicks spring’s critter trend to the next level with these adorable flats ($248 at Neiman Marcus, free shipping with code FEBSHIP). They’re spun of supple cobalt leather with studs in a playful mouse motif. Paint your pout with Dior’s Favori Red ($32 at Sephora; free shipping over $50) to balance the whimsy. This entry was posted in Fashion, Shopilly Buzz and tagged ballerinas, Dior, j.Crew Liberty of London, Kate Spade New York, Marc by Marc Jacobs, Missoni, nine west, Oscar de la Renta, spring ballet flats, Topshop, Tory Burch by BIRDY GREY. Bookmark the permalink.